How to pack a computer, fax machines and printers? 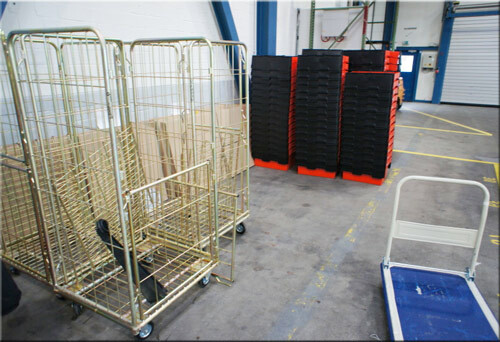 All IT equipment should be packed into IT cages or specially designed IT crates. This is preferable over the ordinary crates as the monitors can be susceptible to “shocking”. When a heavy moving crate is placed on the floor there is a shock involved. The IT team will have decommissioned the CPU / Monitor / Keyboard / Mouse / IEC leads / Network leads and any other ancillary equipment. This should be all noted on the IT audit sheet by either the end user or the IT Engineer. A master copy should be also created and held by the IT team leader. This master copy logs which engineer decommissioned and which engineer recommissioned each piece of IT equipment. All the ancillary items should be placed into a keyboard bag along with the audit sheet and sealed. All other items including Faxes and Printers, Servers are moved in the same way. Particular care is taken with these items by ensuring that they are transported upright therefore avoiding any Toner or Ink-jet spill. Giant elastic bands - PC-bands - are used to secure Printers and photocopier trays. These can be caught on the edge of doors /cages. Any areas with floor lips will be covered with steel plates to allow for the smooth running of the cages and crates. Ramps should be used where needed. All vehicles used for moving the packed IT equipment should have the Air-ride suspension offering a smooth ride for electronic equipment. Each vehicle should also have a tail-lift to enable easy loading. First of all you should be well prepared for packaging computers. Old boxes from a business storage basement and the office tape is definitely not enough. If you want your PC to reach the final destination safely and in one peace you have to take care of it prior to the move. You can always hire proper IT containers but if you want save on moving costs you can simply use some tough boxes, preferably with a five-heavyweight cardboard. You should also buy a solid, thick duct tape and a lot of bubble wrap. These items can be easily purchased in specialized shops or directly from your office removal company. If you have all the necessary accessories you can proceed to the most essential steps, that is, placing PC, fax machines and printers in boxes. It is definitely a time-consuming task, but well-packed computers will speed up the move as well as the unpacking process at the new place. Therefore, do not leave the packing for the last minute and do not rush. Do it a sufficient number of hours before the removal. If you have some spare computers you may want pack them a few days earlier. It is also a good time to get rid of all old equipment by taking it to a recycling centre. Less necessary items can be systematically put away, even a few weeks before the relocation. For more info on how to pack a PC or our guide on computer packing you can simply give us a call a send an email. Our experienced computer movers will be happy to answer all you questions.